Since March of 2003, the FHWA’s Geotechnical Engineering Circular Number 7 (GEC No. 7) has been the standard reference document for design and construction of soil nail retaining walls in roadway applications, and really in all applications. The FHWA has released an updated version of this manual as of February of 2015. This new version is still called GEC No. 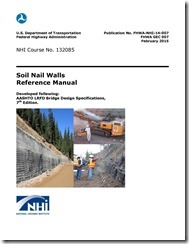 7, but now titled “Soil Nail Walls Reference Manual.” You can download the document from the FHWA’s Geotechnical Engineering website. I am still in the process of working through the manual, but one of the major changes is the addition of the implementation of the Load and Resistance Factor Design (LRFD) platform. This will have an implication on all future soil nail walls for roadway projects. The manual also appears to have removed example problems solved using SNAILZ software (by CalTrans) in favor of the FHWA’s own Soil Nail Analysis Program (SNAP) 2 software. I guess we’re going to have to get familiar with that software as well. I’m strongly considering looking into SNAIL Plus by DeepExcav, a commercial product. I’ve seen demos before, and have been very impressed. Finally, I was very curious to see what they would say about hollow bar soil nails. They review some of the work done in the last 5 years or so done by the FHWA and ADSC. If I understood correctly, it appears that they are saying that because of the uncertainties regarding damage to corrosion protection during installation, they are still not recommending hollow bar nails for roadway applications, except if the ground conditions are non-aggressive and if you use sacrificial steel. I suppose that at least opens the door to this technology for collapsing ground situations.